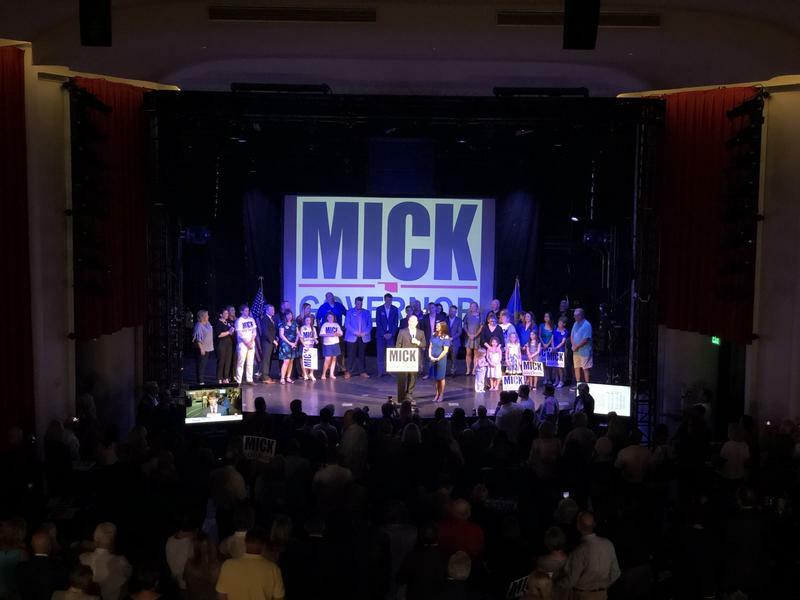 Mick Cornett speaks to his supporters after advancing to the Republican runoff primary election. Drew Edmondson address supporters after winning the Democratic nomination for governor. 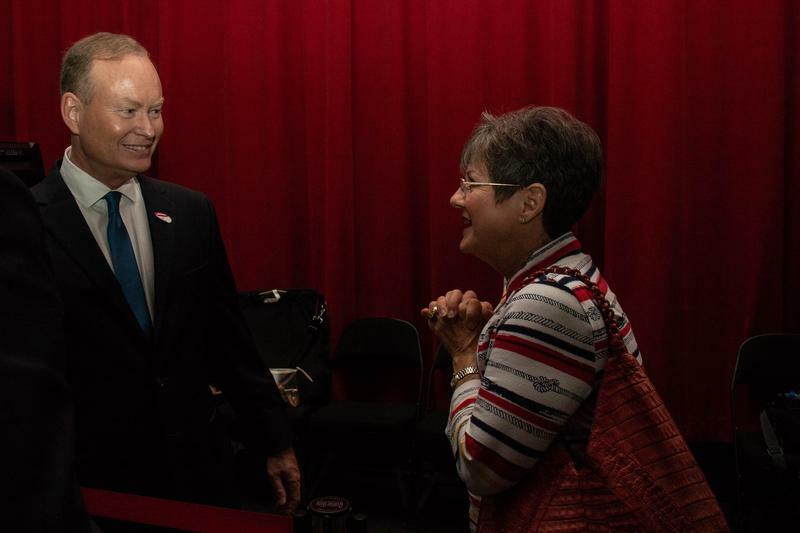 Mick Cornett talks to a supporter at his primary election watch party on June 26, 2018. 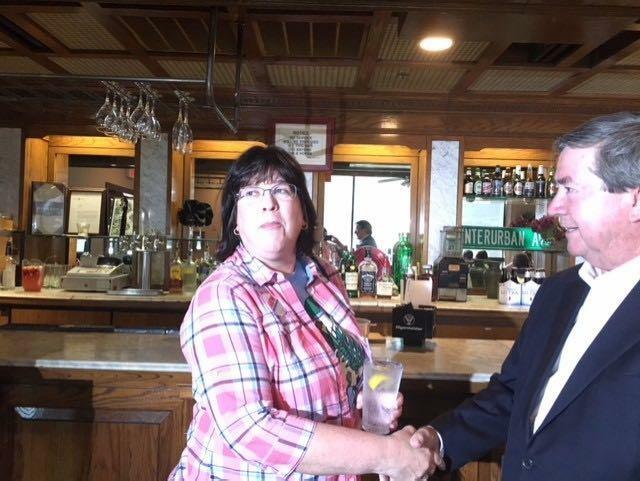 Drew Edmondson greets a supporter at a watch party in Tulsa. 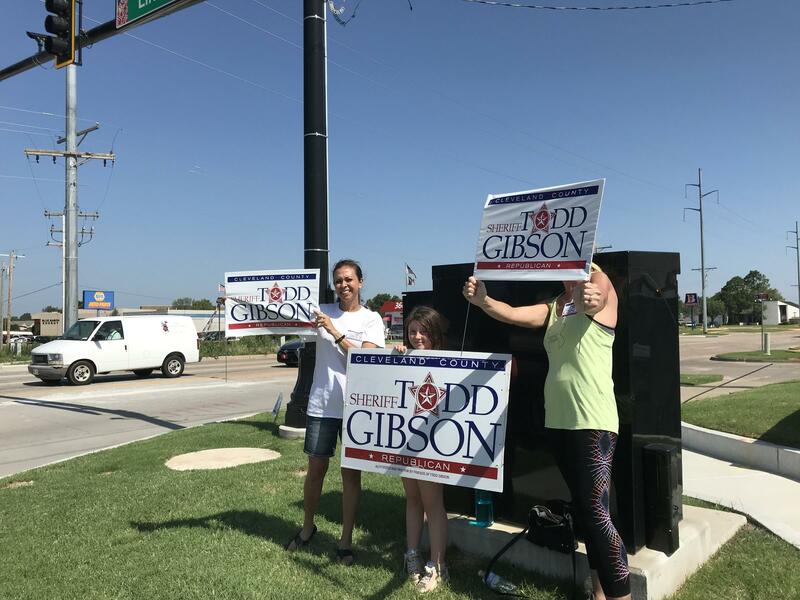 Supporters hold signs for Cleveland County sheriff candidate Todd Gibson. Former Oklahoma City mayor Mick Cornett will face Tulsa businessman Kevin Stitt in a runoff for the Republican nomination for governor. Cornett, Stitt and Lt. Gov. Todd Lamb were all polling closely leading into Tuesday's primary election. There had to be an odd man out to reach to the runoff. The odd man out was Lamb. Cornett finished with near 29 percent of the vote. With 1948 of 1951 precincts reporting, Stitt led Lamb 24.43 to 23.88 percent. The winner of Cornett and Stitt's runoff in August will face Democratic nominee Drew Edmondson. At Cornett's watch party at the Tower Theatre, the former mayor encouraged his supporters. "No one in Oklahoma is giving up on this state. Out best days are ahead of us," Cornett said. Stitt, a political newcomer who founded Gateway Mortgage, thanked his family and supporters for helping propel him into the runoff. "Oklahoma's turnaround starts tonight, folks," Stitt said. Lamb thanked his supporters and conceded his defeat at his watch party in the Renaissance Waterford Oklahoma City Hotel. "I close by congratulating Mr. Cornett and Mr. Stitt for a campaign that was hard fought," Lamb said. The runoff is slated for August 28. Tuesday night’s results are unofficial and could be contested. Any of the ten candidates who ran for the Republican nomination can ask for a recount. If the results aren’t challenged, they could be certified as soon as Friday. At his Oklahoma City watch party, Drew Edmondson thanked independents and educators who supported his campaign, saying his race against former state senator Johnson was clean and respectful. Edmondson wants to win over voters with plans to shrink class sizes in public schools and by hiring more teachers. He also wants to expand health programs and reduce the number of people in prison. "We want programs and solutions for the future for the state of Oklahoma. We’re not living in the past, we’re building a future that our grandchildren can be proud of," Edmondson said. Incumbent attorney general Mike Hunter will be heading to a runoff election. Hunter could not earn over 50 percent of the vote in the three way primary with Gentner Drummond and Angela Bonilla. Hunter and Drummond are the top two vote-getters and will race each other in August. Incumbent superintendent of public instruction Joy Hofmeister will likely go into a runoff as well. At this time, Hofmeister has 47 percent of the vote. She will likely face Linda Murphy. Oklahoma voters approved a state question that will legalize medical marijuana in the Sooner State. Oklahoma passed the medical marijuana question on its first time on the ballot. Current, unofficial election results show State Question 288 garnered over 56 percent of the vote. About 250 precints still have not reported. 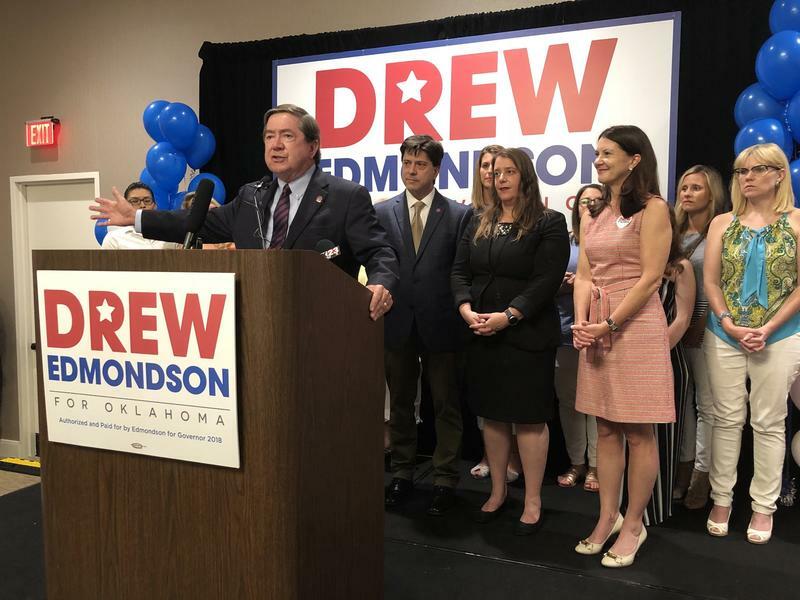 Former state attorney general Drew Edmondson won the Democratic nomination for governor. The Associated Press called Edmonson's victory over former state senator Connie Johnson. The Republican primary remains unsettled. Mick Cornett continues to hold a lead over his closest rivals, Kevin Stitt and Todd Lamb. With nearly 80 percent of precincts reporting, Cornett has 28 percent, while Lamb has 25 percent and Stitt 24 percent. Most statewide Republican races appear to be heading to a runoff at this time. No candidate in the goveror, lieutenant governor, state auditor and inspector, attorney general, superintendent of public education, or commission of labor race have achieved the required 50 percent plus 1 to win the primary outright. The only statewide race in which the candidate appears poised to win the nomination is for insurance commissioner. Glen Mulready is leading that race with 55 percent. State Question 788 has an early lead as election results begin to trickle in. As of 7:43 8.m., the medical marijuana question's YES vote was ahead, 55 percent to 45 percent. In the crowded Republican gubernatorial primary, former Oklahoma City mayor Mick Cornett is leading the pack with 29 percent of the vote. Lt. Gov. Todd Lamb has 25 percent and Tulsa businessman has 24 percent. It is still very, very early in the night, so this only an early glimpse. Candidates need to earn more than 50 percent of the vote to avoid a runoff, and at this point, several statewide races on the Republican side are in runoff territory. No candidate for Governor, Lieutenant Governor, Attorney General, Superintendent of Public Instruction and Labor Commissioner has currently surpassed the 50 percent. However, it is still very, very early in the night. Voters in several precincts have reported not being given the statewide ballot containting State Question 788, which would allow Oklahomans over 18 to keep, use and grow medical marijuana after they get a physician-approved state license. The Oklahoma State Election Board spokesperson Bryan Dean said county election officials received a few reports of problems in a small number of precincts. "They immediately followed up with the polling places and they made sure all their poll workers are on the right page and making sure everybody gets issued that ballot," Dean said. Talked w @OKelections abt ppl not getting #SQ788 ballot: Small # of problems reported in a few places. Officials "immediately followed up with the polling places and they made sure all their poll workers are on the right page and making sure everybody gets issued that ballot." Among the biggest races are primaries for all statewide offices and SQ 788, which would legalize medical marijuana. Ten candidates are running for the Republican nomination for governor. Polls show a tight race between Lt. Gov. Todd Lamb, former Oklahoma City mayor Mick Cornett and Tulsa businessman Kevin Stitt. University of Oklahoma political scientist Keith Gaddie says Republican voters have a lot of choices. “It's a question of what flavor of Republican you want, and we have every flavor of Republican running right now, which is one reason why the vote's so fragmented,” Gaddie said. Other candidates in the crowded GOP field are state auditor and inspector Gary Jones, former state representative Dan Fisher, Gary Richardson, Christopher Barnett, Eric Foutch, Barry Gowdy and Blake Cowboy Stephens. A runoff election between the top two vote-getters is likely in August. Former attorney general Drew Edmondson and former state senator Connie Johnson are both running for the Democratic gubernatorial nomination. The Libertarian Party has a three-way race for the nomination between Chris Powell, Rex Lawhorn and Joe Exotic. The State Election Board saw a surge in votes with more than 73,000 Oklahomans taking part in mail-in voting or early voting last week. Election Board Secretary Paul Ziriax says all voters will have something to vote on today. “Independents can vote on a state question and if they have local judges races, in fact every voter gets to vote on those. There are Republican, Democratic and Libertarian primaries for those voters, and, of course, Democrats, this time, have opened their primaries to independents,” Ziriax told The Oklahoman newspaper. Other races include primaries for state attorney general, lieutenant governor, state auditor and inspector, superintendent of public education, commissioner of labor, insurance commissioner and corporation commissioner. One of the most closely-watched races will be State Question 788, which would legalize medical marijuana. Gaddie says a high profile state question that’s focused on a wedge issue can shape the electorate. “Clearly it's going to drive a lot of interest. Will it drive additional people to the polls? Probably not, because individuals that are most motivated by this issue are already pretty politically active. So they were going to be there anyway,” Gaddie said. You can read Jackie Fortier’s reporting about SQ 788 here, here, here, and here. Another high profile race will be Oklahoma Congressional District 1 to replace Republican Congressman Jim Bridenstine, who left Congress after he was named NASA administrator. GOP hopefuls for the Tulsa-area seat include state senator Nathan Dahm, Danny Stockstill, Tim Harris, Kevin Hern and Andy Coleman. The Democratic side features a five-way race between Tim Gilpin, Gwendolyn Fields, David Matthew Hullum, Amanda Douglas and Mark A. Keeter. Voter registration is up and Gaddie expects turnout will be good. “The thing that we don't know is are they mobilizing because they're upset with the status quo and coming from the left? Or are they upset with the status quo and they want to drive further right? That's something we don't know yet,” Gaddie said. Voters are being driven by different reason to head to the polls today. Kirby Evans, a lawyer from Norman, says he is concerned about the state budget and education. “People that were vehemently opposed to teachers’ raises, every single one of them I will not vote for [them] this time, and that’s just a red line in the sand for me,” Evans said. Kathleen Ellertson, a youth minister from El Reno, says she will cast her ballot in the crowded Republican gubernatorial field for former state representative Dan Fisher. “He’s already worked within the capitol building for several years, seen how it works, seen clearly the disfunction and where it’s broken, and I think he has the will and the resolve to try and fix it,” Ellertson said. Chris Blackledge, a barber from Norman, said he plans to vote in Democratic gubernatorial primary for former state senator Connie Johnson. Blackledge said he likes Johnson’s support for SQ 788. “She is for the 788 so I kind of like that. She just seems more realistic compared to some of these other people,” Blackledge said.